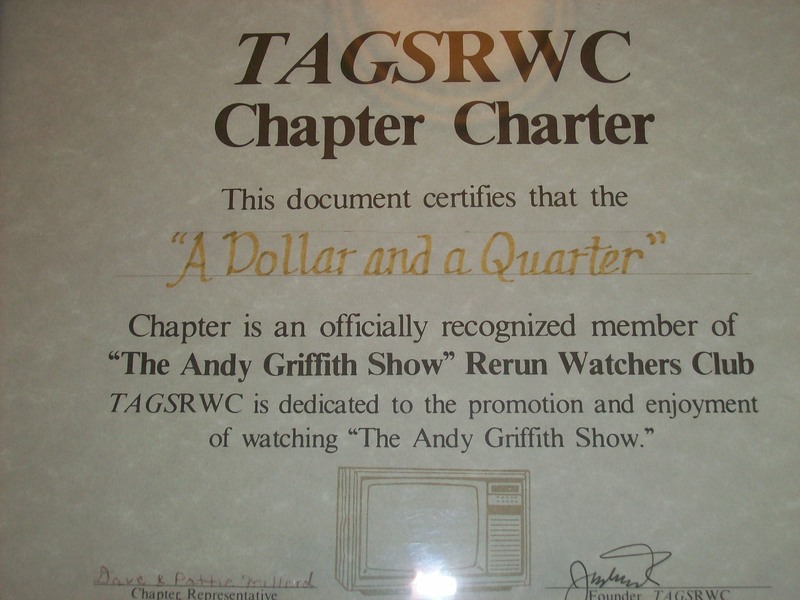 ” A Dollar and a Quarter ” Club Chapter is an officially chartered chapter of The Andy Griffith Show Rerun Watchers Club. The chapter met for the first time in October 1998 at the home of the club founders, Dave & Pattie Millard. A typical meeting consists of watching a rerun, Mayberry News Updates, Original Poems, games & plenty of good food. The chapter currently meets at the beautiful Geib Family Center in Dover, Ohio. The chapter currently has 25-30 members & meets bi-monthly. Activities include, an Annual Pizza Party, an Annual Ice Cream Social, A Summer Pot-Luck Dinner & a Christmas Pot-Luck Dinner which includes a gift exchange. The chapter participates annually in The First Town Days Festival Parade in New Philadelphia, Ohio & has won numerous awards for there participation. Chapter members receive a postcard to remind them of the next meeting. If you would like to find out more about our chapter e-mail the Millards. Stop back by our website anytime.